To be honest i’ve never been a real sushi lover before i turned vegan, the thought of eating raw fish just never appealed to me. That was until about 6 months ago when i decided to give sushi another try (this time completely plant base of course) and i’ve been hooked ever since! The thing i love about sushi is how fun it is to make and eat, plus its simply delicious. 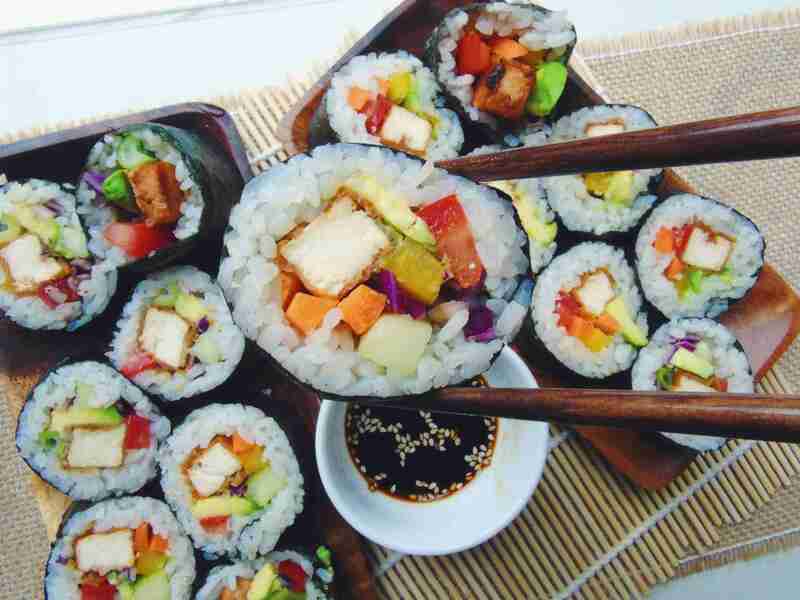 This week i want to share my recipe for delicious rainbow maki, cause we all want to taste the rainbow. Sushi is another one of those dishes that allows you to let your creativity flow and use your imagination. I mean you can basically fill it with whatever your heart desires. Before i made my first attempt at sushi i felt very intimidated, i was under the impression that it would take a long and difficult process to make. This doesn’t mean its super easy cause sushi making is an art of its own, and although i’m an amateur i can still make a tasty sushi, and so can you! Like usual this recipe is open to interpretations, so feel free to mix and match with the ingredients. If you don’t like bell pepper just leave it out, or are you feeling bold? why not add some pickles? you can really add whatever ingredient you love. 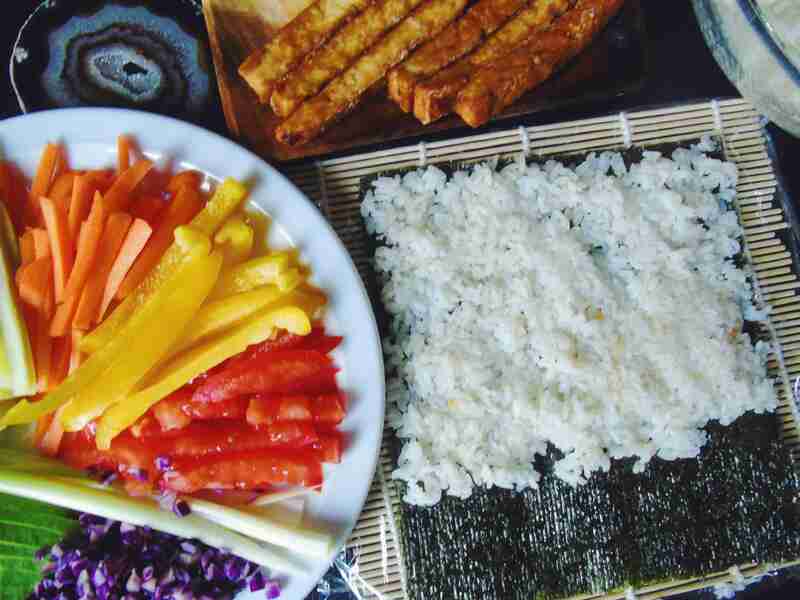 I used different coloured vegetables because i’m a unicorn and wanted to create a “rainbow” sushi. 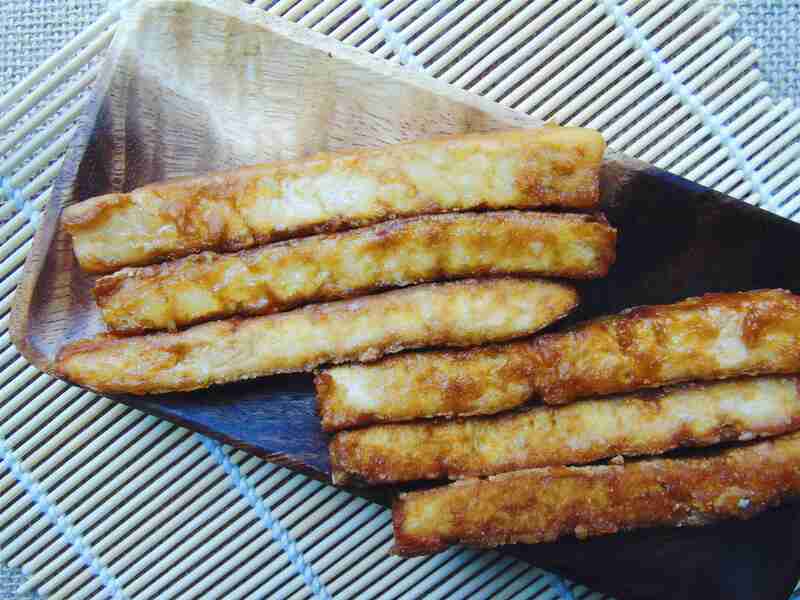 I also decide to add some deliciously marinaded tofu. I made my marinade from scratch, but feel free to use your favourite store bought marinade. When you are using my marinade you can also tweak the recipe according your own taste. If you don’t like the heat just leave out the sriracha, or maybe you just don’t have black salt, don’t worry, just skip it. I hope you all will enjoy this recipe as much as i did, now invite some friends and make some sushi. A colourful sushi that will surely attract some unicorns. Wash the rice until the water is clear, now let it dry in a strainer for about 15 minutes (i skipped this part once and my rice turned out fine too) Now add the rice with 2 cups of water to a cooking pot and bring it to a boil. Once the water starts boiling turn the heat to low and cover the pot and let it cook for about 15 minutes (don't peek) After 15 minutes take the rice from the heat and let it sit covered for about 15 more minutes. Now add the rice to a bowl. in a small saucepan add the vinegar, salt and sugar and whisk over low heat until everything is dissolved. Now add the vinegar mixture over the rice and fold it through the rice so every grain can get some. After this step you can fan the rice to cool it or you can leave it next to a open window. 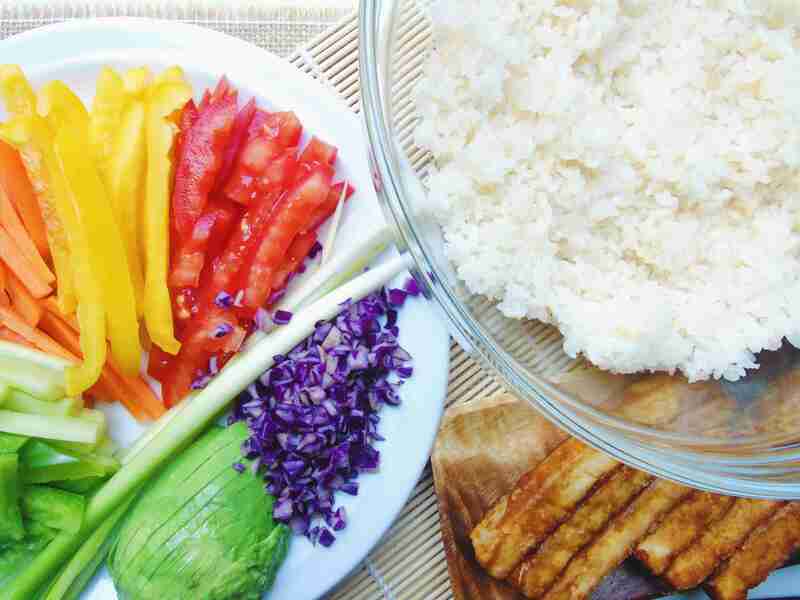 Drain the tofu and place it between a clean paper towel so it can dry. Add heavy books or a pot filled with water on the towel so it can squeeze out extra water, and let it stand for 15 to 30 minutes. 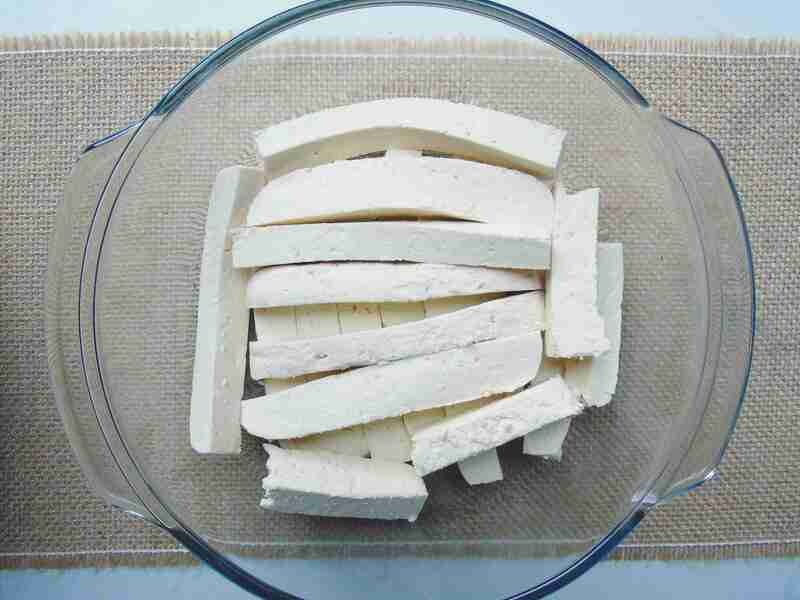 After the tofu dried a bit you can slice it into strips and put them in a container or bowl. Now in a separate bowl whisk together all over the remaining ingredients until everything is well combined. 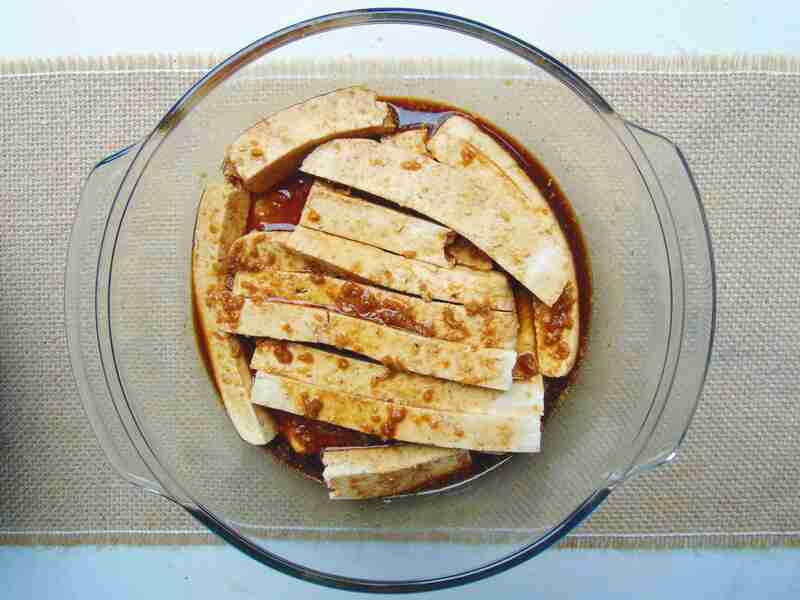 Once combined cover the tofu with the marinade, move it around a bit so the marinade gets everywhere. Let it marinade in the fridge for a couple of hours, or when you're short on time for 15 minutes. 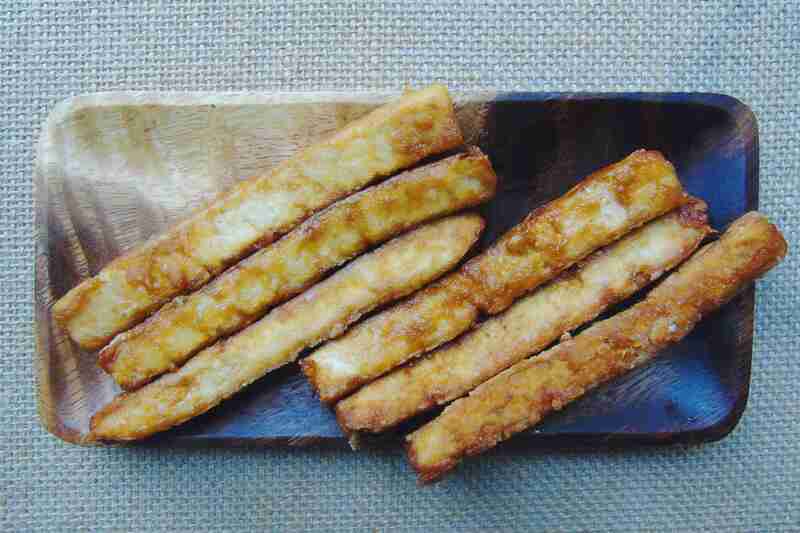 Keep in mind that the longer your marinade the tofu, the better it gets. When you are ready to cook the tofu dip them in some cornstarch. Now some oil to a pan and turn the heat to medium/high, when the pan is hot you can add the tofu and bake on each side until they are golden brown and crips on the outside. Get a rolling mat and cover it with plastic wrap (the plastic wrap isn't necessary but i like it cause it keeps the mat clean). Now place a sheet of nori (smooth side down) and add the rice leave about a quarter of the nori without rice. 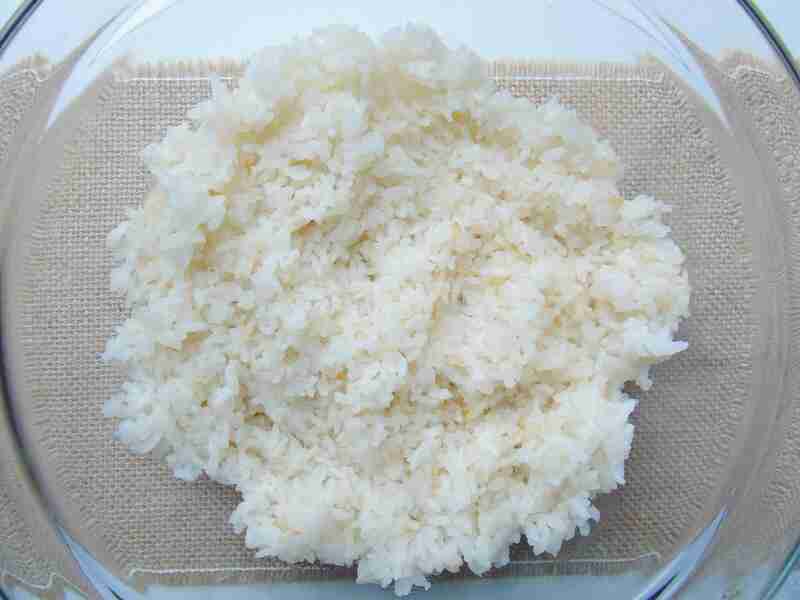 Place the filling in a line on top of the rice near the edge. Now fold the top of the sheet over the ingredients and start rolling. cover the edge with a bit of water so it can seal shut. Let the roll stand for a couple of minutes before cutting with a wet knife. 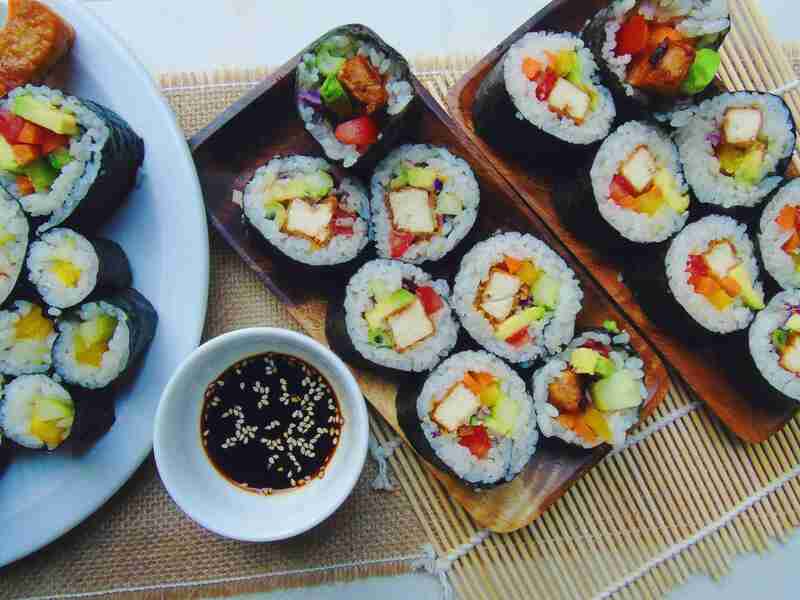 Now serve the sushi with some tamari or soy sauce and start munching! - Feel free to tweak the marinade to your own liking.